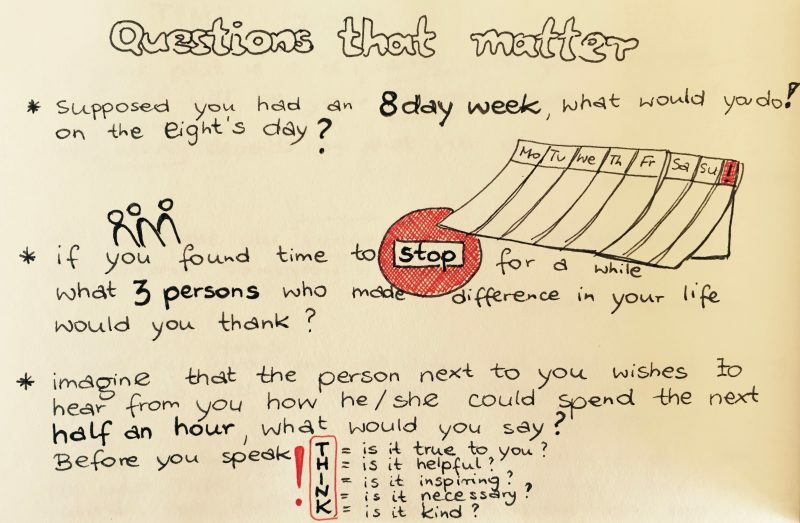 If you had an eight-day week, what would you do on the day 8? Answers to this question vary obviously from generation to generation, from personal preferences to personal preferences and also from culture to culture. Accordingly to Philip Zimbardo, the co-author of “Time Paradox” when US-Americans were asked to answer this question, most of the respondents said that they would… work. Even though, many people in the USA complain that they do not have enough time to spend with their family and friends nor to commit to heir hobbies while answering that question they decided for the answer "to work more". 1. Concern with clock time: Compared to most people, are you particularly aware of the time on the clock? Do you, for example, frequently glance at your watch? Or, on the other hand, are you the sort of person who sometimes forgets the time or even what day of the week it is? 2. Speech patterns: How rushed is your speech? Do you tend to speak faster than other people? When someone takes too long to get to the point while speaking, do you often feel like hurrying them along? Are you a person who accepts interruptions? 3. Eating habits: How rushed is your eating behavior? Are you often the first person finished eating at the table? Do you take time to eat three meals a day in a slow and relaxed manner? 4. Walking speed: Do you walk faster than most people? Do fellow walkers sometimes ask you to slow down? 5. Driving: Do you get excessively annoyed in slow traffic? When you are caught behind a slow driver, do you sometimes honk or make rude gestures to try to speed them up? 6. Schedules: Are you addicted to setting and/or maintaining schedules? Do you allow a specific amount of time for each activity? Do you have a fetish about punctuality? 7. Listmaking: Are you a compulsive listmaker? When preparing for a trip, for example, do you make a list of things to do or things to bring? 8. Nervous energy: Do you have excessive nervous energy? Are you a person who becomes irritable when you sit for an hour without doing something? 9. Waiting: Do you get more annoyed than most people if you have to wait in line for more than a couple of minutes at the bank, a store, or to be seated in a restaurant? Do you sometimes walk out of these places if you encounter even a short wait? 10. Alerts: Do others warn you to slow down? How often have you heard your friends or spouse tell you to take it easier, or to become less tense? (Levine, 2006: Geography of Time, p.20). Future starts now, and to a great extent, it is up to you what happens next.